Meridianville is using Smore newsletters to spread the word online. Meridianville Middle School does not open our doors until 8:00 AM. This is in direct conflict with many of our parents work schedules; often parents drop students off prior to 8:00 AM. If an effort to support our parents needs and most importantly for our students’ safety we will offer Student Morning Care from 7:00 AM until 8:00 AM. 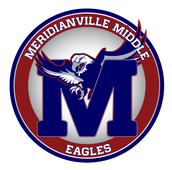 Beginning Monday, October 15, 2018 Meridianville Middle School Student Morning Care will provide a safe and well supervised place for students in the cafeteria. Student Morning Care is at a cost to the parent, there is a weekly charge of $15. Please be mindful if a student is dropped off one day or all five days the cost remains $15 for that week. Each morning students will sign-in and report to the cafeteria. Students will be welcome to study, complete homework, and work on projects during this time. All school rules apply at all times, students are to remain seated and only get up to use the restroom when they are given permission. If students are dropped off in the mornings prior to 8:00 AM it is mandatory and an automatic enrollment into Student Morning Care. If you have any questions or concerns please be don’t hesitate to contact me a cwhitlow@madison.k12.al.us. Mandatory wrestling meeting for wrestlers and parents on 10-16-2018 @ 5:30 P.M. in the Eagles Nest. PTSA will host a meeting tomorrow (10-16-2018) @ 4:30 P.M. for all members and anyone who might want to join. They will be giving updates regarding fundraisers for the school. Student of the month breakfast will take place on December 11 @ 8:30 A.M.
FCA Kicks off this Friday at 8:00 A.M. in the Eagle's Nest. Come join us for fun and fellowship. Friday, October 19, the students will be hosting a pink out to support breast cancer, WEAR PINK! If your child will be walking to Flint River Baptist church on Wednesday afternoons, please send a note or an email to ebryant@mcssk12.org . Students will be escorted to the church at 4:00 P.M.
MVMS Yearbooks are on sale now! The price is $40.00 for the book. Other packages with accessories are available as well. Go to www.balfour.com and search for Meridianville Middle or by city (Hazel Green). The cover on the website is NOT our yearbook cover. It is just an image used by Balfour to represent the product. If you have any questions about yearbook sales, please contact Mrs. Mayer. Students must have a physical on file and all eligibility paperwork to tryouts. Beginning October 1st we will have a competition among our homeroom classes. We will collect can tabs to donate to the Ronald McDonald House on behalf of Lucy Shaw. The homeroom with the most tabs will earn a reward of popcorn and a movie! The contest will end on October 31st. Please keep in mind as you schedule appointments that there will be no check outs after 3:00 P.M. Please turn in all attendance notes to the Main Office. Please feel free to contact any one of us if you would like to volunteer! Please consider joining our PTSA. Officers have been elected. We look for great things to happen to help improve our school! Link to form below! Have your student turn in the form to Mrs. Bryant in the Main Office. Lost and found is located in the Main Office. All items not collected by Friday afternoon will be donated immediately. Students must have a bus note with a contact phone number in order to ride a different bus. All notes must be turned in to the office first thing in the mornings. No check outs after 3:00 P.M. If you plan on getting a physical, please make sure you get a physical packet from the school. Links to sports schedules are listed below. Please find the current athletic eligibility forms below. 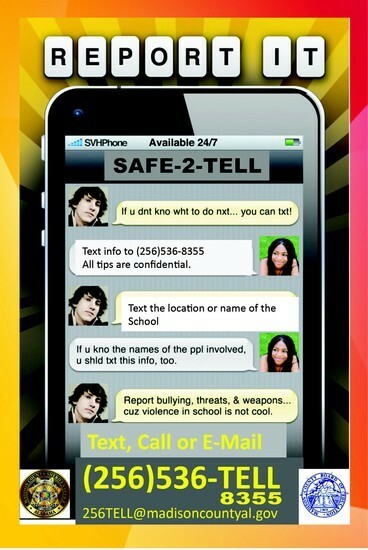 Last Thursday, Sheriff Dorning and Superintendent Matt Massey announced the rollout of the new “SAFE-2-TELL” text tip line. This program allows our students to report bullying, threats, or potentially dangerous activities anonymously and safely. The number is 256-536-8355. We are excited to have a program that allows students to be advocates of their own education by giving them an avenue to take actions that keep their schools safe! An amazing resource is available every hour of every day to families and individuals in need of essential human services – 2-1-1. The 2-1-1 system is for human services needs what 9-1-1 is for emergency needs. In North Alabama, 2-1-1 is provided through Crisis Services of North Alabama in partnership with United Way. Last year, the 2-1-1 Call Center in Huntsville answered more than 37,000 calls from across the state with more than 20,000 of those calls being from North Alabama alone. The majority of callers requested help with basic needs—such as utilities, rent, food, and housing. During times of disaster, 2-1-1 has been critical in assisting both disaster victims and disaster relief providers to make connections. 2-1-1 can be accessed through a statewide website (www.211connectsalabama.org) as well as through our local call center. Your Superintendent Council representative has a flyer and magnets promoting this program. This will be a great resource for our community.